The beautiful star-shaped emblem stamped right on her nose was the first thing that caught my attention. It sparkled just like a “diamond” in the sky. It shined against her dark bay skin like a lighthouse on a stormy sea. It was like a flash beam piercing through a dark cavern. And, it was a quick reminder. This truly was her mother’s daughter. No doubt this was the 2-year-old from my beautiful, yet ill-fated mare Diamond Seeker, who suffered a serious bout of colic after giving birth to her third foal and had to be euthanized about a year ago. No doubt this was Diamond’s middle child, the second of three foals, that she birthed, raised, and gave so much attention and love. So much protection and nourishment. So much life and spirit. No doubt this was her’s. Had to be. Looked just like her. Acted just like her, too. Without a doubt, a “diamond in the rough,” right now. Fuzzy winter coat. Bushy mane and tail. Locks of hair tossed to and fro. And, I’m talking about the filly; not me. She looked more like a gal on a weekend binge than one dressed for a formal affair. Comfortable house coat. Warm slippers. A cocktail in one hand; a tub of “Rocky Road” in the other. Grass belly pooched out around the girth. Hairy legs. Coarse coat. Built right now for the waning winter weather. Built right now like a gangly teenager. Built right now by nature, and nature alone. Yet, my Miss Jacqueline was still a diamond. And, it didn’t take the filly long to catch my eye. Capture my heart and soul. And, stoke my mind with dreams of what could be; what might be; what will be. “This is her,” said Ben Tucker, the filly’s daily caregiver, confirming what my heart already knew and startling me back to reality. Once a daydreamer. Always a daydreamer. I’m thinking a great one, Ben. After all, I can still hear the words of my longtime friend Herb Stevens echoing in my ears. Camped out every morning at the Keeneland track kitchen, the old hard-boot trainer would hold court and tell the same tales over and over to an adoring audience that would laugh, grin, nod, agree and hang on every word. “Nobody ever committed suicide if they thought they had a good 2-year-old in the barn,” he would say for the 1,000,000th time, and then laugh as if he had never told me that before. Herb Stevens may be gone to that great track kitchen in the sky, where the eggs are always warm and the coffee is always steaming. But I never forget his friendship or his logic. And, it was with those words that I jumped in my SUV with friend Ryan Dickey and headed out to see my own 2YO filly this afternoon. With a smile on my face and hope in my heart. As soon as Ben, and his rider, Jordan Pereira, pulled “Miss Jackie” out of her stall, I began to smile. I followed along like a dog chasing a bone as the three of them headed for the round pen. And, I watched in amazement as my furry little ball of racehorse put on a show. Jordan dropped the reins over the filly’s back and directed “Miss Jackie” to the left with a simple wave of the hand. Unprovoked and without any tether or shank, “Miss Jackie” jogged around the round pen as if she knew exactly what she was doing. Always one eye on her friend and coach. Always one eye on the ground ahead. Just once. Almost in a whisper. “Miss Jackie” slowed and then stopped. In her tracks. Turned and looked at her friend and mentor. For a second they just made eye contact and stared. Then, Jordan told “Miss Jackie” to turn in the opposite direction — which she did. And, with a simple wave of the hand, Jordan instructed the filly to jog in the opposite direction. Which she did. A few more trots around the pen, Jordan called her to stop again. Immediately, “Miss Jackie” listened. Obeyed. Stopped. And, stood. When Jordan called for her to come, she stepped right up to her and place her head next to her sitter. I just stared. In amazement. And, I wondered where in the hell Jordan was when I was trying to raise a couple of rebellious kids of my own. My gosh. That gal Jordan is amazing. That filly Miss Jacqueline was amazing. That filly was a diamond. A few seconds later, Jordan got a leg up and the duo headed off to the big barn and a few trips around the long, enclosed, riding arena. They jogged one way in unison. They did a “Figure 8” and then jogged the other way. After a few trips around, they slowed and came right over to me. It was time for this proud “Dad” to tell his “Daughter” that she was doing good. It was time for this proud “Dad” to give her some love. I laid my head next to hers, and she sniffed and smelled and cuddled. It was family reunion. 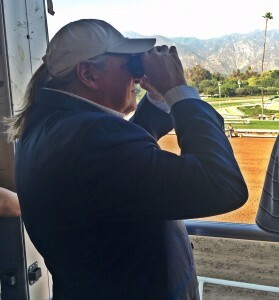 It was time for this proud “Dad” to once again understand why he owns a racehorse. In a few days, when the weather warms and the ground hardens just a bit, Jordan and “Miss Jackie” will take their act on the road. They will gallop the rolling fields and paddocks to the outside. In a couple of weeks, they will get a Uber and go up to the racetrack and learn how to make their way around the oval. In a month, I will be back. Hopefully, my 2YO filly will have grown a bit more. After all, she wasn’t born until June of 2017. Hopefully, she will be getting stronger and better. Hopefully, she will be getting closer to head off to boarding school — at a racetrack and a trainer nearby. And, in a few months from now, I will hope to see her do something her beautiful mother never had a chance to do. Stand majestically in a winner’s circle. With excitement all around. With that “diamond” shinning bright. For all the world to see.